Who is your agent actually working for? When you first sign up with your estate agent, if they are doing a good job, you feel special. After all, they really wanted to be instructed to sell your house, perhaps against stiff competition, and so they almost certainly tried hard to impress you, and in all dealings to be courteous and professional. However, when you receive an offer on your house, it invariably seems as though the agent’s allegiance has switched to the buyer. How can this be? You’re the one paying their commission! Something subtle has happened here, so let me try to explain. Firstly, when the agent wants your business, ie the instruction to sell your house, he will charm and coax you until you sign on the dotted line. He’s won your business and he’s happy. His next task is to find a buyer for your home, so now he’s winning business of a different kind. It’s the turn of your buyers to feel special and seduced, and his aim will be to keep them on track and so that they make an offer. When they eventually do make an offer, the agent’s focus is still on them, and not on you –his client – whilst he cajoles and persuades the buyer to raise their offer to a point at which you accept it. If there remains a gap between the two figures, he may well put some pressure on you to lower your expectations in line with your buyer’s offer. In the US, this doesn’t happen, because each party has their own agent, ie a buying agent and a selling agent. These two agents negotiate between themselves, at their client’s instruction, so you never get the problem that we experience in the UK – that of an estate agent’s conflict of interest. 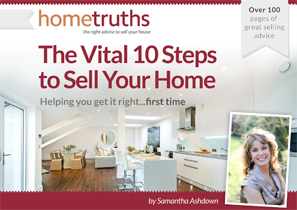 At HomeTruths we believe that at such a crucial moment in their house sale, the seller needs impartial, honest advice, and that’s where we come in. Because we’re working for the seller, and only the seller. A client of ours in Norfolk recently achieved £20,000 more than he expected simply because we gave him confidence in his asking price, so against huge pressure from his agent, (not selected by us, I hasten to add) he held out for the full asking price, and got it. Had he taken his agent’s advice, it would actually have cost him £50,000! If your home is under offer, and you’re not sure you’re getting best advice from your agent, why not give me a call? Pick up the phone now – just think, five minutes on the phone could save you tens of thousands of pounds.